Tough & smart. Edgy & humorous. 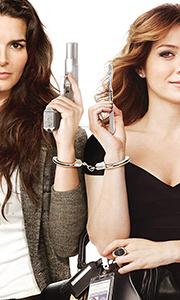 Rizzoli & Isles. Angie Harmon and Sasha Alexander star as combative, working-class Boston detective Jane Rizzoli and cool, cerebral medical examiner Dr. Maura Isles in an exciting police procedural with a compelling point of view, based on the bestselling novels by Tess Gerritsen. The two women have each other's backs as they investigate their city's grittiest and most puzzling homicides, from the Back Ba..
Based on characters created by best-selling novelist Tess Gerritsen, homicide detective Jane Rizzoli and forensic pathologist Maura Isles are close friends, complete opposites and on the case in all 15 gritty Season Two episodes. This season sees brash Jane healing emotional and physical scars as old loves reappear and her mother Angela deals with divorce. Meanwhile Jane’s ex-con brother Tommy has eyes for cerebral Maura, whose own fami..
Cop shoots medical examiner's mob boss father! When an explosive misstep drives a painful wedge between Boston's finest crime-solving colleagues, Jane and Maura must set aside their personal difficulties in order to keep on top of the city's most heinous murder cases. Yet analysing corpses and tracking killers is child's play compared to the complications that arise from the friends' respective parental units: Maura meets her biological..
Own Rizzoli & Isles Season 4 DVD from Deff, DVD, Blu-Ray & 4K Video Specialists - Free UK Delivery.. The complete fifth series of the American crime drama based on the novels by Tess Gerritsen. The series follows Boston homicide detective Jane Rizzoli (Angie Harmon) and her best friend medical examiner Dr. Maura Isles (Sasha Alexander) as they join forces to solve crimes. The episodes are: 'A New Day', '...Goodbye', 'Too Good to Be True', 'Doomsday', 'The Best Laid Plans', 'Knockout', 'Boston Keltic', 'Lost & Found', 'It Takes a Villag.. Hundreds of threatening emails. Credit accounts hacked. Her apartment burned. A death message found inside a murder victim. Someone has it out for Detective Jane Rizzoli in Season Six, and she’s consumed with finding out who. As clues keep coming and Jane is assigned a bodyguard, Boston’s finest are put on the case in a race against time…until medical examiner Dr. Maura Isles disappears, victim of a possible kidnapping. As the investiga..